A source of tokens extracted from a character array. Definition at line 1333 of file cpp_token_stream.h. Construct a token source from a pointer to the beginning and ending of a character buffer. h the preprocessor directive handler. Definition at line 1344 of file cpp_token_stream.h. Construct a token source from a character buffer but pretend it is from a file whose name is specified (and an optional preprocessor directive handler). 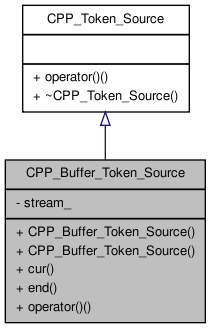 Definition at line 1358 of file cpp_token_stream.h. Definition at line 1384 of file cpp_token_stream.h. Definition at line 1385 of file cpp_token_stream.h. Definition at line 1376 of file cpp_token_stream.h. Definition at line 1340 of file cpp_token_stream.h.